A few weeks ago, Answers in Genesis, a ministry I love, promote, financially support, and am blessed by, posted The Dangers of the Hebrew Roots Movement. Please read the previous posts in the series, as I am answering the allegations one by one. This is why the Apostle Paul confidently wrote that those who have been saved by faith in Jesus Christ are “not under the law” (Romans 6:14, 7:4; Galatians 5:18). 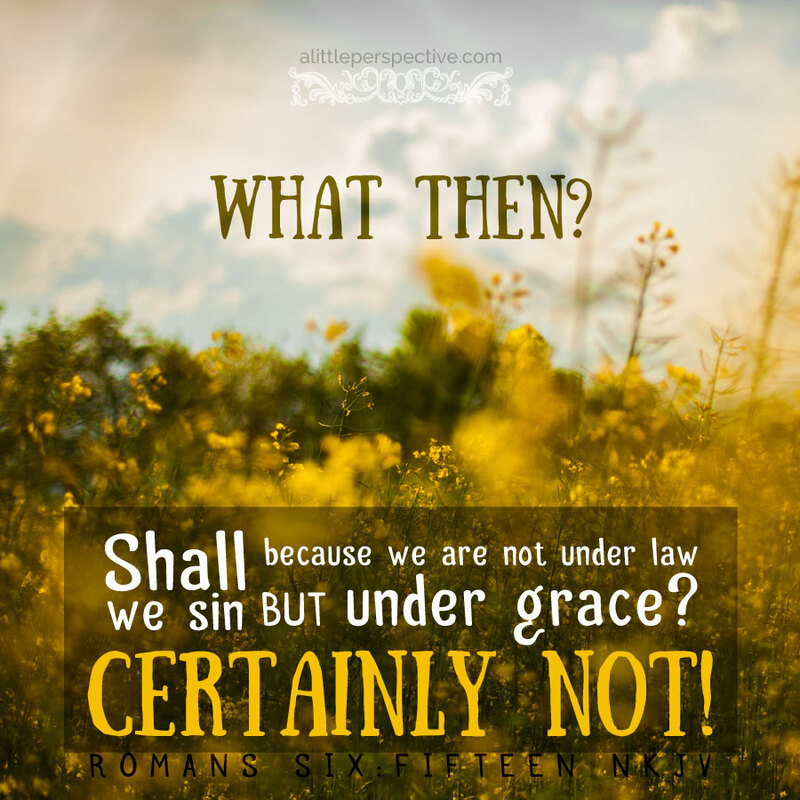 Rom 6:14 – sin will not have DOMINION over us, because we are not under Law but under grace. “Dominion” from the Greek means, “to be lord of, to rule over, to have dominion over.” Dominion, according to Webster’s, means “supreme authority or absolute ownership.” Where there is dominion, there is something over and something under. When we are under Law, though, it is not Law that has dominion over us, but sin (Rom 5:21, 6:12, 14) and death (Rom 5:14, 17, 6:9). In contrast, to be under grace is to let Messiah’s resurrection life have dominion over us through grace (Rom 5:17-18, 21). This has to do with where our righteousness is coming from, as Paul has been explaining since the second chapter of Romans! When a person is ruled (a dominion word) by striving after self-righteousness through works of the Law (to be “under Law”), then sin and death have dominion over him (vs. 14); but when a person is ruled by not striving after self-righteousness because God’s righteousness has been imputed to him through grace leading to life (to be “under grace”), then obedience and life have dominion over him (vs. 14-16). To make it even more plain: the old man who was born after the nature of his father Adam, over whom sin and death reigned, has died. The new man who was born after the nature of his Father YHVH through Jesus Christ, over whom righteousness and life reigned, lives. We are a different creature now, one over which sin does not have dominion. Our new nature is one in which obedience has dominion, because our righteousness is not earned. We don’t have to work, so we can simply live in accordance with our new nature. Paul has not left his topic, which he began in Rom 2: that is, that when we try to obey the Law from our flesh, the fruit that is produced is sin and death. For no one can obtain right- standing by the works of the flesh and observance of the Law. This is Paul’s central point which we cannot forget! But in contrast, when we by nature do what the Law requires, because God has recreated us with a new nature, with His nature, our obedience of the righteousness that the Law defines proceeds from the resurrection life which we have from Jesus Christ, who obeyed the Law in righteousness leading to life, and the fruit that is produced is obedience and life! So when Paul says we have become dead to the Law, does he mean that God’s instruction in righteous living, contained in Torah, no longer applies to us? This is the interpretation the AiG article is making. But how can it be right, when Paul just instructed us that we ought to present our members as slaves to obedience leading to righteousness? To what does Paul suggest we become obedient? Of course, that which God has said! What He has voiced, His Word, which contains His Law. It is the instruction or teaching in righteousness, which is not sin, which is holy and just and good, and which is even spiritual (Rom 7:12). Of course it has to be, since the Law came forth from the mouth of God, by the Spirit of God. God’s Word and His Spirit agree, and His Word, which includes Torah as the foundation, which is Messiah (John 1:1-3), is not divided against Himself to cross purposes. In short, Paul is saying that we have become dead to trying to obey the Law from our flesh, through the body of Messiah. We lay down our own flesh, because the body (flesh) of another has allowed us to lay it down. Through the body of Messiah, we have access to God’s righteousness now, and we are free from needing to establish our own righteousness by works of obedience to the Law. Because we have died, we can now be married to another – our relationship to God is now just that, a relationship, rather than a religious system, which is what anything done out of the flesh becomes. The fruit we bore when we were under Law, when we were in the flesh, i.e., when we were trying to establish our own righteousness by the working of the flesh to obey the Law, was self- righteousness, pride, sin, and death. Now that we have been delivered from the Law, i.e., delivered from having to obey the Law in order to try to establish righteousness, the fruit which we bear to God, now that we are under grace, and our righteousness is of God and not of the flesh, is true fruit! (Gal 5:22-23). Now instead of serving in the oldness of the letter – having to obey the Law from letters written on tablets of stone outside of our hearts – we are serving in the newness of the Spirit – we are obeying the Law from a new heart in which the Spirit has written the Law on the tablets of our hearts, inside our hearts. (Eze 36:25-27). We are still serving the same God who has not changed, whose definitions have not changed, and whose Word has not changed. What pleases Him has not changed. What has changed, is us! Instead of trying to serve Him from our flesh and failing, now we are serving Him from our hearts by the Spirit, by grace, by new life, and succeeding! What is in opposition to each other is not grace vs. the Law or even faith vs. works. We have seen elsewhere in Scripture that the Law is a gift of grace: the Law of the Sabbath provides for rest even though the consequence of our sin condemned us to work, Gen 3:16-19. We have seen elsewhere in Scripture that one who has faith also has works which give evidence of that faith, Jam 2:14-26. But what is in opposition, is the Spirit and the flesh. Paul is saying that the Spirit and Law which is written on the tablets of our hearts, expressing the will of God, is on one side, while the flesh and sin, which is rebellion against the will of God, is on the other side. The Law merely defines what behavior is righteousness and sin. It is a dictionary, a reference. So why does he say, if you are led by the Spirit, you are not under the Law? Remember the definition of “under Law.” This is Paul’s shorthand meaning, “under the indictment of the Law;” which condemns to death those seeking self-justification by the Law. We are not seeking justification by the Law and so are completely out of that brownie- point works- based system for justification. Now that the issue of justification or salvation is settled, there is another issue — sanctification, or the learning process of daily walking in holiness or right actions before God. The Spirit inside of us causes us to walk in the manner which is pleasing to God. His Spirit aligns our hearts with God’s heart and our wills with God’s will. God has revealed His will to us. He has shown us what behavior pleases Him. His Law is the written expression of His will. So the one who is walking in the Spirit will be loving of others, in obedience to His will and His Law (Rom 13:8). They will be peacemakers in obedience to His will and His Law; they will put others first in obedience to His will and His Law. They will fulfill the Law without even thinking about it at times, because the fruit of the Spirit comes out of their lives naturally. The phrase, “against such there is no Law” does not mean that those who are Spirit- filled can now ignore the Law as a dictionary for the definition of righteousness and sin, justice and injustice. It merely means as we have seen before, that Love is the ultimate goal and expression of the Law. The one who loves is obeying the Law. The one who is self- controlled is obeying the Law. The one who treats others with humility and kindness is obeying the Law. But if we live by the flesh, then we are opposed to the Spirit and the Law, and the fruit that comes out of our lives is sin, that which hurts ourselves and others, and that which is an offense to God. Paul affirms in verse 21 that he is not saying that the Law is now to be ignored and obedience is no longer required, because he says that those who make a practice, a lifestyle, of living by their flesh, doing that which offends God in transgression of the Law, will not inherit the kingdom of God. And this is so, not because we are now justified by the Law, but because the lack of concern for others or care for the heart of the Lord God shows that they never received Christ and the Spirit in the first place.